Cherry Bounce next to the Vin de Noix. I first tasted Vin de Noix, green walnut wine, in a small restaurant in the Paris neighborhood Le Marais. I’ve never found the restaurant again, no matter how many narrow streets I turn down, but the taste of Vin de Noix never left me. When, several years later, I found the recipe in a small preserving book written in French on yellowed pages I did not expect several more years to pass before I could finally make it. For many years I spent fall weekends at farmers markets, seeking locally grown black walnuts, the ones that are so delicious in a Thanksgiving pie or stuffing. About 12 years ago, I spotted them and struck up a conversation with Suzanne Behling (Nob Hill Orchards), who told me the immature walnuts that fell from the tree in the early summer were an annoying ankle turning nightmare. I offered to turn those nuggets into booze. The following spring, we discussed it again. And she brought me a huge paper sack full of green walnuts. They smell like Christmas. Clove and cinnamon and mace. They’re slightly sticky. I’ve made vin de noix or nocino every couple of years since then. It’s ready in early December, ready to become a memorable hostess gifts. Suzanne has retired and my supplies were dwindling. I thought about driving several hours to a place I knew I could get walnuts, but then Domenica Marchetti came to the rescue. Not only did she have some walnuts for me, she was up for a swap – nocino for vin de noix. Walnut forests grow in great swaths across the US. and for hundreds of years have been planted for the hard wood, for the dark stain, for the ripe nut, dried and stored over the winter. But don’t overlook the green nut or even the leaves. Check out my article for Garden & Gun’s latest issue to read about Chesapeake Bay Sauce, made from the young leaves of the walnut tree. How to find green walnuts? Ask around at your farmers market this week. Stone fruit growers or apple growers often have a walnut tree or two. It’s worth the hunt. 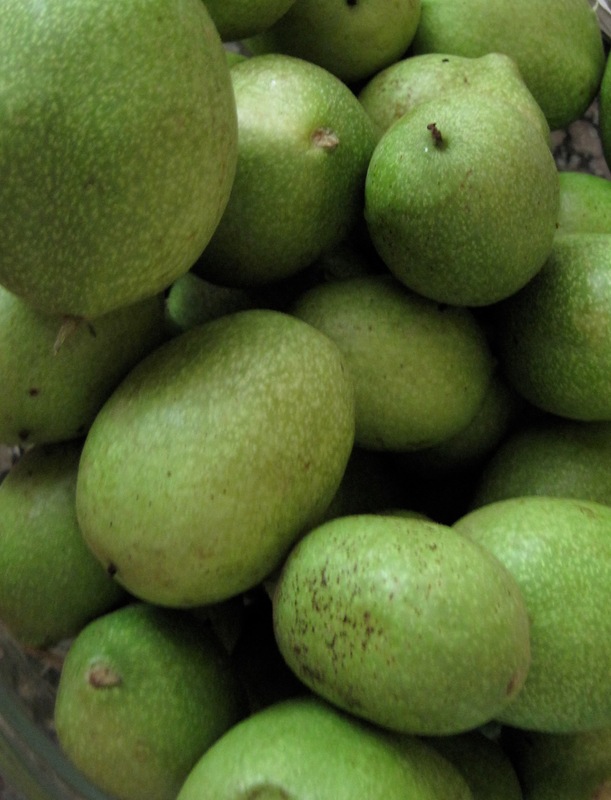 Of course, green walnuts may be ordered online, too. Walnut stain is serious business. Wear gloves or wait a few weeks until it wears off. Gather the walnuts in late June when the nuts are well formed, but can still be pierced with a needle. Soak the nuts in cool water for 1 hour. Drain, dry and quarter. Place all of the ingredients in an non-reactive container with a lid. I use a large 5 gallon glass jar. Stir well to begin to dissolve the sugar. Most of it will be on the bottom of the jar at first. Store in a cool dark place for 40 days, stirring occasionally. Strain through cheesecloth into a very large non-reactive bowl or food-safe bucket. Taste, and adjust the sugar if you want the drink to be sweeter. It will be a little harsh tasting, but will mellow as it ages. Funnel the wine into quart jars (I repackage it in smaller decorative bottles for gifting.) Store in a cool dark place, letting the vin de noix age until December 1st. Serve ice cold. With mandelbrot or buttery cookies. Especially nice in front of a crackling fire. This sounds amazing! I’ve actually gone and purchased the book – can’t wait for it to arrive! Thanks! 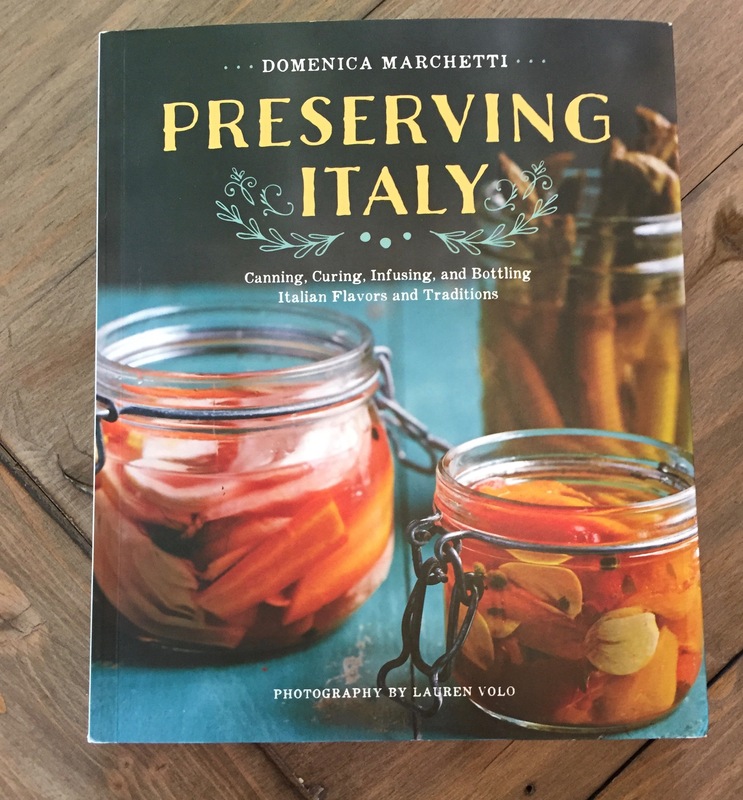 Also….what is the Bulgarian preserving book you mentioned – can it be ordered also? I only have photo copies of some of the pages, Debby! We are making our vin de noix, too, this week at Camont. Somehow all wrapped up in Summer Solstice and the bonfires of St. Jean on June 24- (24 nuts, 24 lumps of sugar, 24 days steeping) it makes sense to ready something for the cold Winter so far ahead. Walnut flavored vinegar is a la mode around here and the Bay Sauce recipe is a perfect next step. Here’s to long summer days. Viva les noix! Thanks for the shout- out, Cathy- can’t wait to try this recipe! The invitation still stands, though right now our walnuts look smaller than they should for the all- important feast day of St. John the Baptist. Gives us time to prep for the harvest- and find good gloves! I want to make it so badly but can’t find green walnuts. Damn! 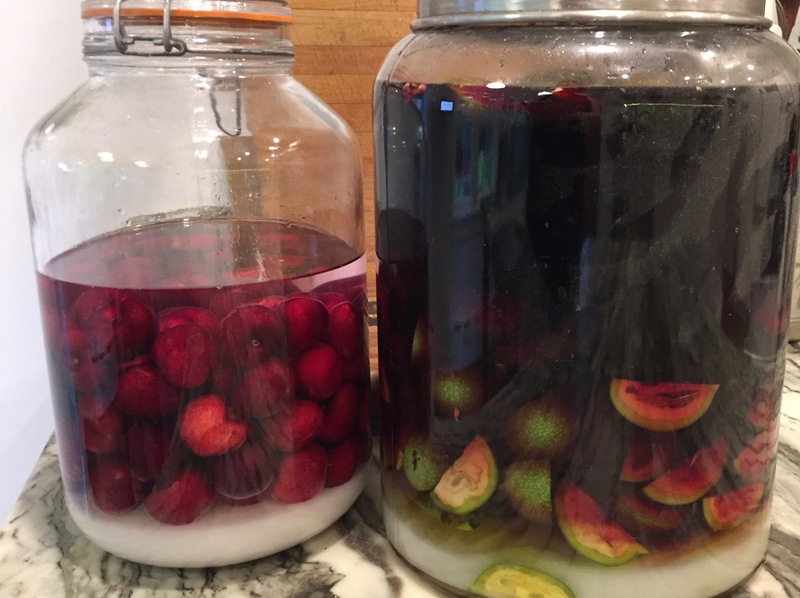 We have been making nocino for several years now, using a recipe from a friends grandmother. It is always delicious, so good that I just planted 10 walnut trees so I will always have a steady supply. I will definitely give your vin de noir a try! Thanks! Just a note on Domenica Marchetti’s book. I am always on the hunt for preservation recipes that are unique and/or different than you find in your basic canning guides. I preordered her book and am delighted with it. While I have not yet started making any of her preserves there were a number of them I will be trying throughout the summer; including a red onion relish made with a hearty red wine. It all just sounds so wicked good. Finally a reason to pick my green walnuts before the squirrels come and steal them…….I can hardly wait to try this. We have eaten green walnuts preserved in syrup and they are delicious. If the shell has formed, the vin will be bitter. Hello, We had vin de noix in France….lovely! But I am confused.. is it black walnuts or regular walnuts? …or does it matter? Thank! Either black or English walnuts (regular) will work, but the trick is to get them while they are still green. Before the nut forms. 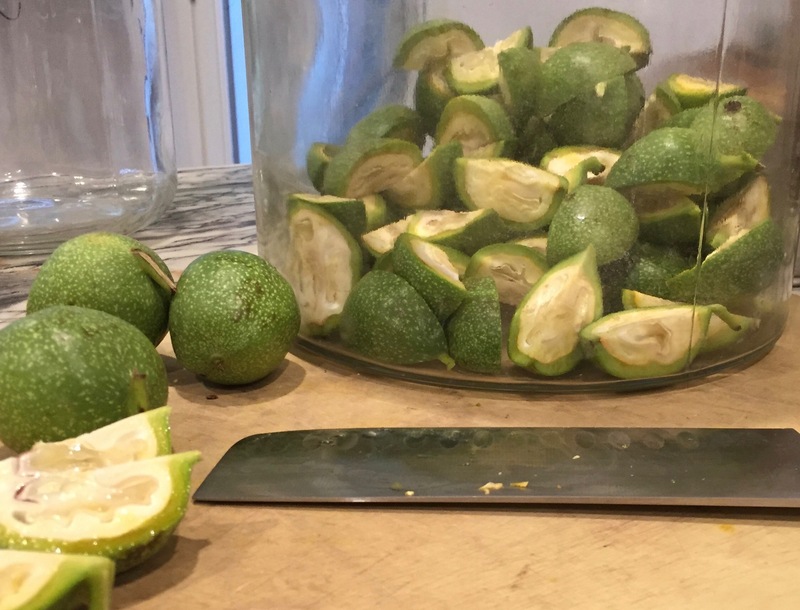 Old recipes say “when a needle may be passed through.” Find a farmer who grows walnuts and make arrangements to go in June to pick up some green ones (it’s fine to use the fallen ones).